One things that was pretty cool to see with the new HTC One M8 camera is the shallow depth of field effect that can be given to photos, due to the duo camera that HTC has built into the device. While not everyone will care about this feature too much, it can make some photos look amazing if focal points are directed at the right spots. The downside to seeing all these cool pictures taken with the new One M8 camera is that those of us using other devices who like the effect can feel somewhat left out. Thanks to an app called After Focus though, you no longer have to. 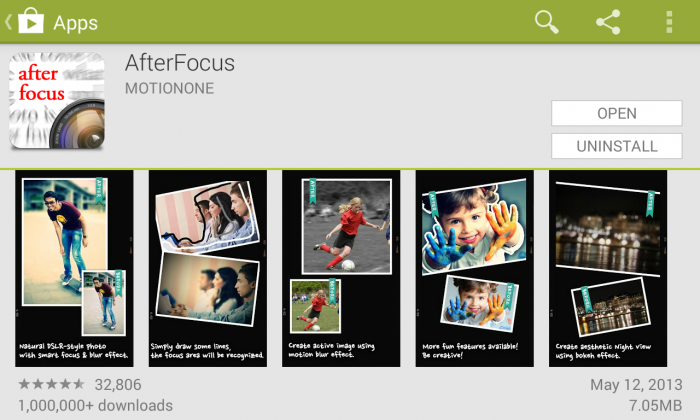 After Focus is not a new app, to be clear, but seeing as how the new HTC flagship device has a lot of attention falling on the re-focus effect that you can apply to every single picture you take, the After Focus app is getting some more attention as well. The reason is because you can be on just about any android device and take advantage of this awesome app. The only requirement that I could see was that the device have android 2.0+. There is most likely no one left on the planet using anything below that, so virtually everyone on android can probably find this app compatible. The app is pretty simple to use and if used correctly you can end up getting some awesome results. You can apply the blur effects in one of two ways, either smart mode, or manual mode. Manual mode you can guess puts all the work on you, so you have more control to apply the blur where you want it. Smart mode basically applies the effects for you with minimal effort on your part. You can choose to take photos within After Focus before you apply the blur effects, or you can apply the effects to photos from your gallery that have already been shot. This can be especially useful if you have a device with a really nice camera with some of their own cool effects. The app is free, but there is a pro version available with more filters and effects like using edge feathering to smooth the transition from the focused are to the background, making things look more natural. The free version is ad supported, and is available through this link if you want to give it a try. The post Get The Refocus Effect From The HTC One M8 With An App Called After Focus appeared first on AndroidHeadlines.com |.